Saturday was slightly profitable with the main under bet in Charleroi vs Oostende being a winner. 3 more interesting matches to work with on Sunday. One of the important factors in this match will be the poor pitch. Each year it's the same problem since both Cercle Brugge and Club Brugge play in the same stadion. This fact also pretty much eliminates the home advantage because Cercle only has so many fans that they are unable to fill the entire stadion. It can be said that Club Brugge right now is not playing at 100%. Vanaken after winning the golden boot here in Belgium has issues to deal with it often is the case for players that win this trophy. Vormer has been out of form pretty much the entire year and there seems to be some conflict with the coach and Wesley who is questionable also has not reached his best form. They do have quality and if they manage to push during a match they can be really dominant still. However, to bet them pre-game is not an option for me and I need at least some strong confirmation live. Cercle had poor results lately with 4 Losses and 1 draw but have played better than results indicate. Lambot is still injured and creative player Hazard might start on the bench. I could not resist taking a tiny position on Cerlce Brugge +1.25 @ 1.885, but won't hesitate to hedge out of it when needed. 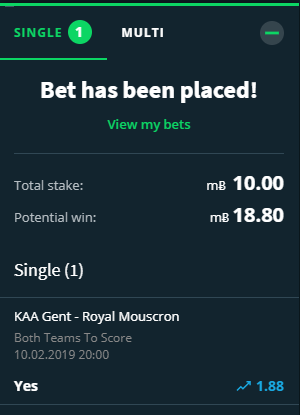 Both these teams are in a good flow, Moeskroen is in a safe zone and playing freely while AA Gent reached the Cup finals and are currently inside the top 6 fighting for their place. I do expect this to be a match with forward intentions from both sides who will be looking for the full win. AA Gent should be the team with more quality and their most important players Odidja, Bezus & Dompé will all be in the team. Moeskroen has gone over 2.5 in all of their last 5 matches and their total stats on the season are more based on them being unable to score for many matches early in the season. I expect both teams to score and split my stakes between Over 2.75 @ 1.95 and Both To Score @ 1.814 and also have some room to get in more live. The BTS match is available on sportsbet and I took some extra in that in BTC @1.88 after the price boost but will count the 1.82 odds for the SBC League record.